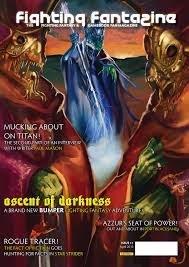 One of the reasons that we play gamebooks and RPGs in general is to immerse ourselves into new worlds and explore dark corners for shining new treasure. We want to know what kind of people and monsters populate the world, interact with its people and know what the weather will be like tomorrow. Is the 'Which door' choice really necessary? : I've borrowed this term from Ashton Saylor. It stems from the most common use of this choice - you are in a dungeon and you are standing in front of two doors. 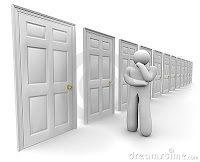 Which one do you go in? Ashton discusses the many issues with this choice. I will look at it from an exploration point of view. Say you in an abandoned dungeon with two doors. You go through one, have an encounter and then move on deeper into the dungeon or you choose the next door. That is frustrating in many ways. I wish I'd taken a left. 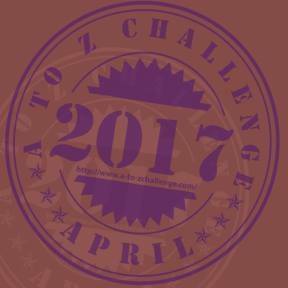 From an exploration point of view, the which door choice can be frustrating if the book does not allow you to backtrack for no good reason. Why can't I just wander around Deathtrap Dungeon until I've found all of the gems? How about exploring all of the corridors of Firetop Mountain or all of the streets to Port Blacksand? The real life answer is that you can, but it would turn the book into a time consuming exercise, which takes away any real choice and, barring bad dice rolls, makes victory a lot easier. There are some ways to keep someone from just exploring everywhere. One is by blocking off the route back (One FF book does have a portcullis descend after going past a certain point). This works up to a point, but it might look a bit contrived if EVERY door sealed shut behind you and EVERY passage had a portcullis or boulder block it up. Another way is to have a time limit. If the consequences of being late are severe, then I could just put in the text 'You can only visit one place before x happens.' and then use the narrative to guide the player then. Giving the player a time score where something bad happens if it reaches a certain level also works but in a different way - you still have to give the player the freedom to move around and they have to discover for themselves that they can't explore every nook and cranny before their mission fails. This route (pun intended) certainly allows the player to backtrack. However, the player has to make a directional choice at every point and this can get tedious. 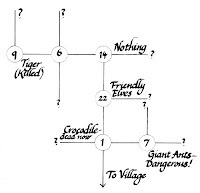 It certainly has a point if the aim of the game is to make a map and if clues involving directions are involved but even if these are used to good effect, there is a rist that the player will just get annoyed and making a load of directional choices instead of juicy action adventure choices or choices where you interact with the characters. This method certainly has its uses if mapping is important or if there is a time limit and people give you hints on a route but it must be used sparingly. I think Scorpion Swamp did this a little too much (I do think that Scorpion Swmp does have loads of good stuff about it though such as a magic system and three quests). How about this. If a player arrives at a place where they are free to explore wherever they want and there is no real time limit, I could have a paragraph describing the place that they are exploring along with a description of rooms don't really contain anything interesting or if something is easy to find, have them automatically get it. This saves them turning to lots of paragraphs saying 'You open the door to a room with a pouch containing 10 gold pieces.' followed by 'You open the door to the other room to find a sword.'. Instead, they read a description of the place that they are exploring and then add any items to their equipment list. Then, list all of the places of interest that require further exploration for the hero to go to. No 'East or west?' choices as the player already knows their way around. There's no need to describe every corridor and room and the player can get straight to the bits with the action in them. This method is served very well by a map such as the ones you find in Grailquest 2 or in Destiny Quest. Each location has a reference that you turn ti. This still leads to a player being able to go everywhere, so you could impose a time limit on this either with a score or just by limiting the number of places the player can go (only introduce a new attribute when necessary. Don't introduce a numerical attribute when a couple of sentences can serve the same function). Another method of limiting the number of places a player can visit is by giving them an option of one place to go from several, each place having its own group of places to explore. 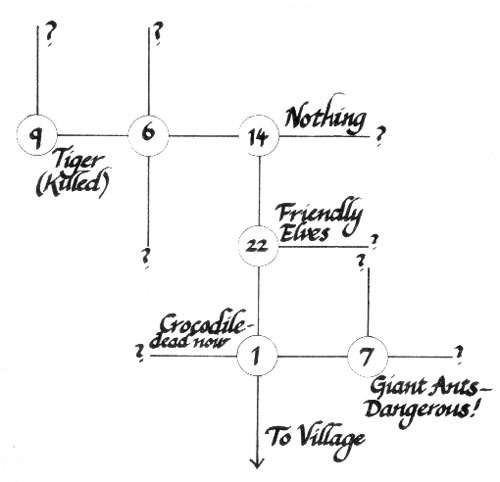 Going to place a allows you to explore places x, y and z while going to place b allows you to go to places c, d and e (or you could have them cross over so that you could go to place e from both places. Another nice way to limit players ability to over investigate every corner of your setting before progressing only when super-powered up can be Ian's trick in the Temple of Terror, where hidden here and there by a Messenger of Death are "things" that, if you overdo, will kill you.